The U18 US National Team is the two-time defending world champions. 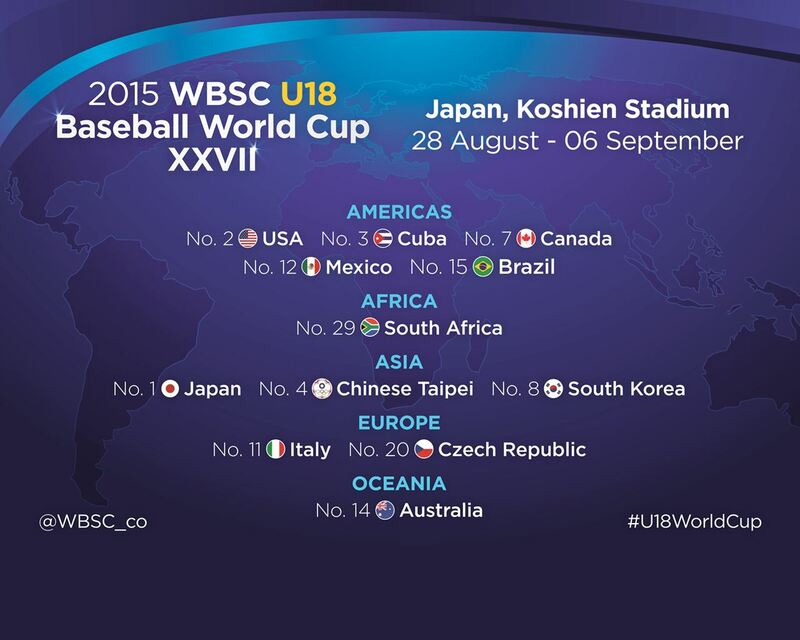 USA will also enter as the defending world champions at the 2015 WBSC U12 Baseball World Cup, which takes place from 24 July – 2 August in Tainan, Chinese Taipei. The 2013 WBSC U18 Baseball World Cup held in Taichung (TPE) had a potential broadcast distribution reach of over 144 million homes and potential online/mobile reach of 22 million unique users. WBSC's biennial U18 baseball world championship has featured some of the biggest names in the sport, such as Canada's Brett Lawrie, Japan's Yu Darvish and Shohei Ohtani, South Korea's Shin-soo Choo, Cuba's Yasiel Puig and Aroldis Chapman, and USA's Justin Upton and Buster Posey, among countless others. The most recent generation of rising stars include Cuba's Jorge Soler, USA's Francisco Lindor and Canada's Dalton Pompey, all of whom played at the 2010 U18 Baseball World Cup in Thunder Bay, Canada (which will return as host for the 2017 WBSC U18 Baseball World Cup).